Could Moderate Drinking Impact Osteoporosis? 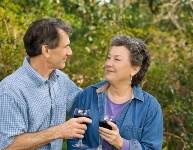 Home » Anti-Aging » Could Moderate Drinking Affect Your Bone Health? First off, let’s start with the word “moderate.” That is the key phrase whenever doctors’ advice starts including another word: “alcohol.” So, from that quick launching point, let’s take a look at a brand-new study that might provide another health breakthrough in the imbibing category. Moderate alcohol consumption may have a beneficial effect on osteoporosis in women. PLUS: What about alcohol’s effects on stroke and heart disease? Weak bones result from an imbalance between the normal breaking down of bone and creation of new bone. This natural process for all adults is called “bone turnover.” For poorly understood reasons, after menopause, new bone is laid down less effectively. This causes a drop in bone density. A variety of substances (calcium, vitamin D, and various medications) have been used in an attempt to prevent the development of osteoporosis. And in large population studies, the moderate consumption of alcohol has also been shown to lower this risk. And this is where the new study comes in. In a study published in the journal “Menopause,” researchers looked at 40 healthy postmenopausal women whose average age was 56. They measured factors that relate to osteoporosis in several situations: while consuming alcohol at 19 grams a day; after they had stopped drinking; and after they had resumed their alcohol consumption. Excessive bone turnover, combined with too much bone loss and not enough bone formation, is the principal cause of osteoporosis. The study concluded that alcohol decreases the turnover of bone. This then leads to less dissolving of bone, which means stronger bones and a reduced risk of osteoporosis. The study also showed that abstinence from alcohol resulted in increased markers of bone turnover (hence, higher risk of developing osteoporosis). And when they resumed drinking alcohol in moderation, it reduced bone turnover again. Why? The researchers identified cellular mechanisms that triggered the increased bone density seen in postmenopausal women who are moderate alcohol consumers. Though this is encouraging, it is never a good idea to use alcohol specifically for a health-related goal. It remains a powerful and dangerous substance open to abuse. Just know that a glass of wine a day for women might be good for the bones.